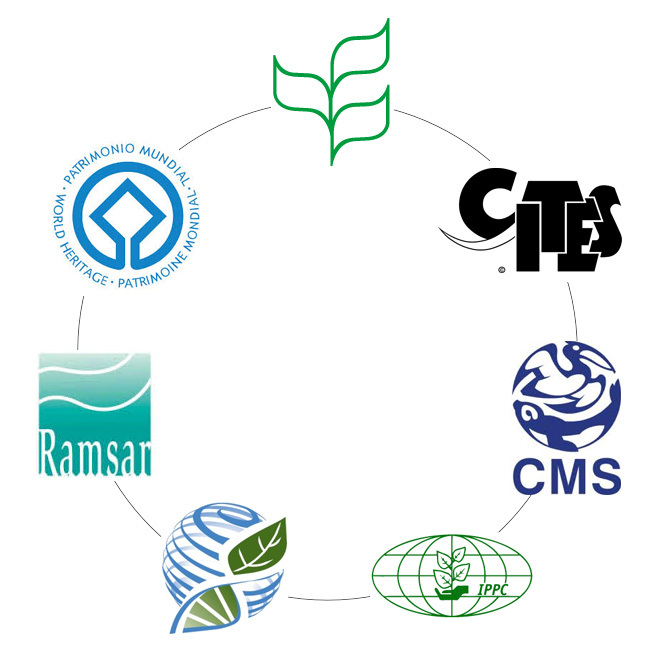 Goal 3 of the CITES Strategic Vision: 2008 – 2020 is to “contribute to significantly reducing the rate of biodiversity loss by ensuring that CITES and other multilateral instruments and processes are coherent and mutually supportive”. Such coherence and mutual supportiveness are needed at both the national and international levels. - international financial mechanisms and other related institutions. Specific efforts include the adoption of relevant resolutions and decision by the Conference of the Parties, the establishment memoranda of understanding with above mentioned organizations and agreements, participation in cooperative groups. etc. More detailed information can be found below. The Liaison Group of Biodiversity-related Conventions was established in 2002 pursuant to CBD Decision VII/26. 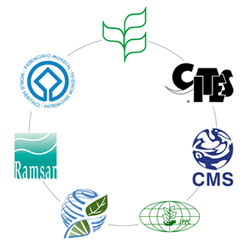 It currently comprises the heads of the secretariats of the seven biodiversity-related conventions (CBD, CITES, CMS, IPCC, ITPGR, Ramsar and WHC). The Group’s aims are to explore opportunities for collaboration and increased coordination, and to exchange information. On the occasion of the second high-level retreat of the members of the Liaison Group of the Biodiversity-related Conventions (BLG), held in Bogis-Bossey, Switzerland, on 4 September 2011, the members of the BLG adopted and signed the Modus Operandi which will be sent to the Conference of the Parties (COP) of the respective members. More information on the BLG is available here. Following a suggestion made by the CITES Secretariat at the fourth meeting of the Biodiversity Liaison Group (BLG) (Bonn, October 2005), the BLG agreed to propose a meeting of the chairs of the scientific advisory bodies of biodiversity-related conventions. The purpose was for the chairmen of these bodies together with representatives of the secretariats to enhance scientific cooperation, share information about their conventions' scientific activities and processes and collectively support progress towards global biodiversity targets. Convened by the Convention on Biological Diversity and with the support of the United Nations Environment Programme, the first meeting of the CSAB took place on 1 july 2007. The Environment Management Group (EMG) is a United Nations (UN) System-wide coordination body. Its Membership consists of the specialized agencies, programmes and organs of the United Nations including the secretariats of the Multilateral Environmental Agreements. It is chaired by the Executive Director of United Nations Environment Programme (UNEP) and supported by a secretariat provided by UNEP. 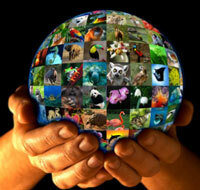 IPBES stands for ‘Intergovernmental Platform on Biodiversity and Ecosystem Services’. IPBES will be an interface between the scientific community and policy makers that aims to build capacity for and strengthen the use of science in policy making. ICCWC is the collaborative effort by five inter-governmental organizations working to bring coordinated support to the national wildlife law enforcement agencies and to the sub-regional and regional networks that, on a daily basis, act in defence of natural resources. ICCWC is comprised of the CITES Secretariat, INTERPOL, the United Nations Office on Drugs and Crime (UNODC), the World Bank and the World Customs Organization (WCO). The CITES Secretariat chairs the alliance. Click here for more information on ICCWC. Click here for the Letter of Understanding between ICCWC and the CITES Secretariat. The MEA Information and Knowledge Management (IKM) Initiative develops knowledge and information tools for MEA Parties and the environmental community. It currently includes 25 international legally binding instruments on environment from 14 MEA Secretariats hosted by three UN organizations and IUCN. The Initiative welcomes the participation of observers with expertise in knowledge and information management from MEAs. The MEA IKM Steering Committee is the main driver of the MEA IKM initiative. It consists of representatives from the participating MEA Secretariats and relevant observers. The Steering Committee meets once a year and is co-chaired by UNEP and the CITES Secretariat. The Terms of Reference of the Steering Committee were agreed to at the 1st MEA IKM SC Meeting. Working Groups try to meet every two months using video-conferencing to work on the implementation of projects as directed by the Steering Committee. The MEA IKM Initiative is facilitated and supported by a small UNEP-DELC team based in Geneva. The first achievement of the IKM Initiative was the conceptualization and development of the InforMEA Portal (www.informea.org). The Portal compiles and presents COP/MOP decisions and resolutions, news and events, MEA membership, national focal points, and soon national reports and implementation plans. The project was designed to ensure long-term sustainability of the project by harvesting information directly from databases hosted at MEA Secretariats. In this manner, new data is registered in InforMEA whenever an MEA Secretariat updates its databases thereby ensuring that information is always accurate and up-to-date.